An excellent piece in the New York Times today talks about ‘Monks Gone Bad’, describing a corrupt and violent Sangha that uses hate speech and abuse against minorities and is helmed by leaders who resemble fatuous politicians and not the ‘birds of the wing’ that the Buddha wanted his mendicant followers to be. I am not here to point out the contradictions between Buddhism as taught and Buddhism as practiced, the ingloriousness of Buddhist praxis nowadays is evident for all to see. I just wanted to point out that at every instance in that article where I saw Myanmar, I could have easily inserted Sri Lanka. For every instance where I read about 969 in the news, I can insert ‘Bodu Bala Sena’. About the only words that do not require replacing are ‘anti-Muslim’, ‘minority’ and ‘hate’. As we all know, the police, together with the Bodu Bala Sena soon disbursed the vigil, arresting some, manhandling others, and collecting the names and pictures of most of the attendees. The Bodu Bala Sena and its kindred run amok in Sri Lanka, like bullies in a school playground, and with not much more in the way of finesse. They hurl offensive invective towards religious minorities, and their words have resulted in quite a few violent incidents against Muslims ,and at least one against Christians, re-opening wounds in the country that are still struggling to heal after the 30 year war. They seem to operate in a space where Sri Lanka has not just lost so many lives, its economic development, and so much of its natural beauty to a long, long war. In order, perhaps, to call their attention to this, a peaceful vigil was held outside the headquarters of the Bodu Bala Sena. As we all know, the police, together with the Bodu Bala Sena soon disbursed the vigil, arresting some, manhandling others, and collecting the names and pictures of most of the attendees. Not only this, the Facebook page of the Bodu Bala Sena decided to ‘name and shame’ these attendees, causing their supporters to enact the most disgraceful bout of name-calling, verbal harassment and racist trolling that I have ever seen on social media. 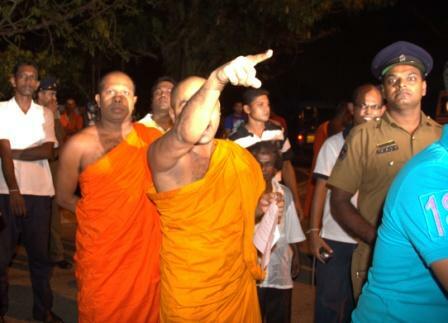 One of the ‘points of order’ from the Bodu Bala Sena, its supporters and some of the media who covered the incident, was that the legitimacy of the vigil was in question because the attendees did not represent the Buddhist population, that many Muslims, Christians and Hindus were present. On Facebook, attendees are called out as ‘demalek’ ‘muslimayek’ ‘jathiyak nathe’. Indeed, an attendee tweeted that he overheard someone saying that the vigil was convened due to a ‘conspiracy of Muslims and Catholics’. So much for a critical understanding of religious history- perhaps the speaker would be better served from devoting his time to education rather than racist troublemaking! To each his own, however. It is altogether more worrying thing that this misrepresentation of the attendees was not only picked up by the media, but that it was also the feature of an article by Malinda Seneviratne, writing in the Colombo Telegraph. The good gentleman, from his considerable experience, no doubt, is able to discern a Buddhist from a non-Buddhist, and therefore writes an entirely unnecessary article that serves only to distance himself from standing with those who attended the vigil. In response, Dr Dayan Jayatileka – who is experiencing some changes to his tune- quite rightly pointed out the flaws in Mr Seneviratne’s argument, but did it in a manner that entirely calls attention to his own accomplishments and ‘stake’ in the manner. The riposte from Mr Seneviratne was then, to accuse the good Doctor of ‘throwing his CV’ at him. I ask you, gentlemen, is this really the response to what is happening in Sri Lanka? The actions of the Bodu Bala Sena, and the complicity of the government in them are grotesque enough without the debate being reduced to puerile attacks on each other’s logic. If you have a voice that can be heard and that has gravitas, and you both have the great privilege of this, why not turn it more fully toward more constructive dialogue? Why not ask that the rights of those who attended the vigil be defended? Countless women- because the body of the woman is so carelessly mangled in these cases- are facing vile, misogynistic abuse via Facebook from the supporters of the Bodu Bala Sena. These men direct all their perverted, violent fantasies at these girls who really do not have much in the way of legal succour. After all, the AG has instructed victims of social media attack to file complaints with the police. Yes, the very same police who put the kybosh in the vigil. Why not direct more energy into rousing the non-English speaking Buddhists to speak out against the Bodu Bala Sena with less articles in places like the Telegraph which are read by the diaspora and the English speakers? Yes, the handicap at the vigil was that there were many who attended who were ‘English speaking’- but that does not make them any less Sri Lankan, any less Buddhist, any less angry, or any less valid in their protesting attacks on minorities. Give out your voice in solidarity with each other, with those who will question the validity of the Bodu Bala Sena, and in solidarity with what must be a better tomorrow. In regard to the tangle that Malinda Seneviratne and Dayan Jayatilake got into, in the matter of who represented the masses at the vigil, I see the symptoms of a disease that afflicts many Sri Lankans in their society. One is the routine presence of jealousy, although unacknowledged and perhaps not even recognised for what it is. The invective is often a direct result. Another is one-upman-ship. Anything that one “intellectual” does, the other “intellectual” feels the need to usurp or downplay in order that his own light shines brighter. Another rather obvious outcome is the development of a complex that could be destructive, in that emotional energies are directed at destruction of the person rather than towards a constructive analysis of the issue. I do hope that readers and writers become cognizant of these types of aspects when issues of common interest nearly always fall by the wayside, to be exploited by the ravenous vultures that feed on a society’s misery. It is a pity that these so called BBS is allowed to go unchecked in their attempt to destoy the ahimsawadi chinthanaya in buddhist philosophy. How can a handful of thugs with some in buddhist robes declare that they rpesent the buddhist majority of the country. Who are these people. Why cannot the Mahanayake’s denounce these people and their acts. If the Maha sangha does not act fast to stop this BBS menace we buddhists will be treated like nigantayas. Which tune and what changes? The first public conclave in Colombo against the recent wave of religious extremism was organised by the Liberal Party and I was a speaker. The most recent one was organised by the Young Media Professionals and my anti-BBS speech made entirely in Sinhala (a rarity) was posted on this website. I have criticized the religio-chauvinist wave in every interview I have given on Sinhala language TV, FM radio and the press, and that number runs into double digits. The term ‘Ethno-Religious Fascist’ was first used by me in the title and body of an O-Ed page piece in the Daily Mirror. Why doesn’t the writer use her energy to do the same thing she urges others to…and communicate the anti-BBS message in Sinhala in the mass media? Going further back in time, I was publicly defending the first President of Sri Lanka to adopt a multi-ethnic, multi-religious, multilingual policy, namely President Premadasa, when some practitioners of a ‘free media’ were conspiring in the company of warmongers such as the former Minister of National Security, to impeach him, while the fascist Tigers were conspiring to kill him. Malinda Seneviratne and I have debated race, religion and secularism in print, since 1999-2000…and most prominently for some weeks in mid-2009 in The Island when I argued the need to implement 13A and hold the Northern PC election. I did this…..I did that….I said this ……I wrote this……..me is great ! I think it is sometimes necessary to let others know what the senior diplomacts have done. So, there is no wrong DJ any other diplomats revealing the facts. All these facts can save the folks among the international communities. I am not sure, whether you are informed adequately how the current rulers sometimes appoint their representatives embassies. Why not you check the credentials of many who have been appointed by FM today. I bet you significant majority will share you their view if you would raise the questions srilankens in the US. Many of them are even ashamed of their country today. That is the reality. Just because a person is just relatives of MR means not that he or she could be qualified to work as a diplomat. Ha ha! So Dr. Dayan has never been wrong and never been on the wrong side of the divide!!! He only helped prop this Rajapaksa regime! He argued for this regime only. He only defended this regime. So what ? He was then doing a paid job ! Now he is not and now he can say what he says, till the next posting. That’s what the academics are any way doing. Go on Dr. Dayan. You are just another ! Lasantha Pethiyagoda makes a very good point. The social issues facing this country are far more important than rivalries and jealousies;educated intellectuals should try to solve these constructively instead of destroying one another. I notice also that CT prides itself on accepting only english commentaries. Perhaps it should then censor the use of foul and filthy comments as well. Dialogue-for and against- can well be conducted in correct and elegant language. Heaven help Sri Lanka when so much space and energy is consumed in debating the manner in which two of the most opportunistic and unprincipled people in the country are trying to distance themselves from a sinking (Rajapaksa) ship! First of all BBS’s violence (violence can be physical or verbal or mental) against minorities have not been addressed by the police and the defense secretary, although under the Prevention of Terrorism Act there is ample room to bring BBS to courts. It is shameful to see that a student taking coconuts to get money to paint a school was taken to courts but not this violent monks. Secondly BBS leader who was charged by the courts for drunken driving once again violating the laws of the country, that too a law that is designed to prevent terrorism. Even if the regime does not want to do anything it is the fundamental duty of the Mahanayakes to ex-communicate these monks of BBS. That is not happening. On one side the legal system is not working on the other the religious system is not working in Sri Lanka. What does this say, it says that Sri Lanka is no more Sri Lanka, its just Lanka and it has gone to dogs. Its time for the civilians to take action and the time is ripe. There is no point in depending on the opposition, especially UNP as the leader of UNP is in the pockets of the regime. If the civilians of Lanka do not take action then the foreign major powers will take charge of the Lankan destiny. Finally a sane voice in this madness. “Yes, the handicap at the vigil was that there were many who attended who were ‘English speaking’- but that does not make them any less Sri Lankan, any less Buddhist, any less angry, or any less valid in their protesting attacks on minorities.”- Malinda seneviratne for all his accomplishments can’t seem to or does not want to accept this fact. At least these so called “english speaking buddhists” had the guts to organize something like this and the least one could have done was to applaud their courage rather than rant and rave about the ethnic dis proportionality seen within the protest!And who doesn’t have agendas these days? Isn’t it a decent compromise that these agendas should be tolerated since the core issue they seem to be fighting for is a prevention of a bloodbath between two communities in SL? 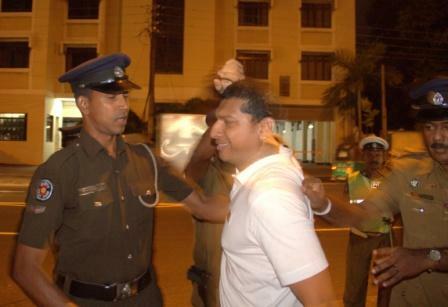 Lankans are awesome at nitpicking,grumbling and being vitriolic like Mr Seneviratne, but are famous for being men of inaction when a situation demands action. That is what this protest was primarily about. Galvanizing a apathetic nation into action against racism and intolerence! Let us roast the BBS basteds. BBQ the BBS? Good Idea! Unless we are all willing to call a spade a spade, irrespective of who and what we are, we can go on debating this issue for years to come and will never arrive at understanding the reality on the ground. Thanks Anupama! We needed this. What disciplene and justice one can expect from Police when a good bottle of Kasippu could be obtained from it’s Thimbirigasyaya head office.Also watch for policemen after 7.00 pm….BBS,Ravana, Rawaya all are in the same boat. Yes, they are available and could be found in those personnel trunk boxes that are reserved to policemen if you know them. Also a single traffic cop could easily make 30,000 rupees per day as pocket money, depend on the location he serve, leave alone other millions of needs that one seek their help. If Casinos, clubs, brothels are operate in the heart of Colombo, it’s anybodys guess how they become so successful……now GOSL planning a 36 Floor Mega Casino heaven in the heart of Colombo city. Therefore which policeman bothers to look into discipline and Justice on public during a candle light vigil. Also the commands from higher authorities and implementing them show the Business ties one has. ARE YOU ALL MAD AND CRAZY TO SEEK JUSTICE FROM POLICE DURING A VIGIL WHICH VERY SOON WILL BE A NECESSITY DUE TO HIGH ELECTRICITY RATES. Only if you check out the constant,suprised overnight transfers of DIG’s to HQI’s,to Sub Inspectors and regular Police officers, you will notice what’s the absolute morons expect from the Police Department. Also the package comes with the carrot and stick theory recognizing their surrender to absolute power leaving Justice,truth and freedom aside. What is BBS doing in USA. I know they plan to have meetings, but what type of meetings and what is their message……If anybody has any info…..
in the morning CT is colombo Today in the evening it is colombo telegraph.confusing and stinking fishy smell.several CT news continuing every day made me think that all the news are not true and fed up seing such news items every day. it feel that some body is trying to condemn our beloved country for their personnal gains. Read state newspapers and state media to get true state news, now monopolised by ruling family. By the way hope you got your free laptop and the duty free car permit from Araliya Gahe Medura. Whose “our beloved country” you talk about……. Is it the Sinhala Buddhist cult Monopolized by a gang of thieves. Also there are no white van abductions, sudden disappearances, runaway brides to other countries happening in Colombo Telegraph or Ceylon Today. FYI.